Master Key PMs oversee all aspects of a project — from start to finish. Our Project Managers work from a Project Management Plan (MS Project) developed collaboratively with our clients. Our project management model is shown below. 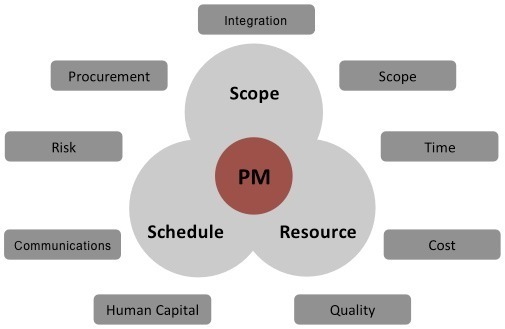 In this model, the nine PMBOK® knowledge areas surround the key core to project management which is scope, schedule and resource. Project communication – We develop plans designed to enable understanding and motivation for leadership development and the change initiatives. Critical to success of the communication plan is developing messaging that provides a “line-of-sight” linkage between the employee and the expected outcome from their work. We develop a communication plan describing how to communicate the right messages to the right people at the right time. Our plans contain communication goals, stakeholders and strategies, activities and timeframes. The purpose of our communication plans is to achieve intended project outcomes by keeping everyone informed with a consistent message.